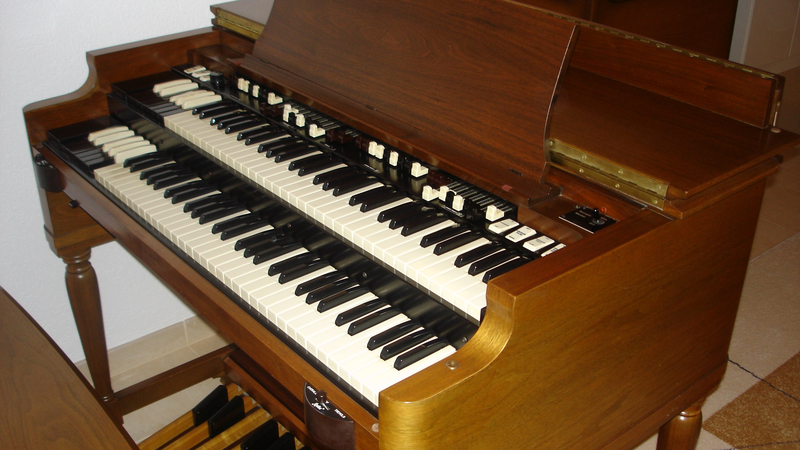 In 2009 Hammond introduced an upgraded version of the new Hammond B-3, combining modern technology emulating the 96 tone wheels but also with ten-contact mechanical key switches, Leslie emulator and MIDI. 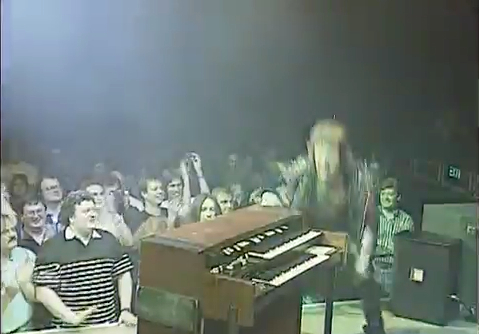 It sounds very good – video in the side bar “The New (2009) Hammond B-3 mk2” – website here. Our B-3 in these pictures is serial number 95144 which dates its manufacture to around 1965 – the time of Jimmy Smith’s BBC video below. It was imported second hand into Europe – 60hz motor replaced with a 50hz version, Leslie sockets rewired – and sold for a highly inflated price – but we love it! Did the Hammond Organ company know what they were about to do to the music world when they invented the tone-wheel generator? Initially the target was institutions (churches, etc) and the Leslie (slowly-rotating) loudspeaker became an essential part in emulating the moving sound of wind from organ pipes. Fast-rotation emulates the lush sound of a cinema organ. When up-coming jazz player Jimmy Smith heard this new instrument, he was able to envisage its place in making jazz come alive in a new way as well. He reportedly disappeared for a year and emerged ready to take the jazz world by surprise – having experimented with the B-3 — mastering new sounds and ways to play. His success is legendary, and so is the sound the “B” has brought to musicians and performing groups of all genres across the world (more favorites listed in the side bar, available on YouTube). The sound of the B-3 seems like being with even more generations to come – those tones are modeled in keyboards, available as dedicated software emulators, even the physical style continues to be re-created and manufactured. And, there is an active market for repairing, even reconstructing, the original. Same goes for the essential Leslie rotating loudspeaker system. Today, we can enjoy all the advantages of the ‘screaming beast’ without its enormous weight (again, see the New B-3 mk2 video in the side bar). A more recent B-3 sits in the Chalet of Claude Nobs in Haut-de-Caux above Montreux. Back in 1969 (just a few years after the manufacture of serial number 95144 but unknown to us) our audio club “discovered” the Hammond organ and arranged a recording session. 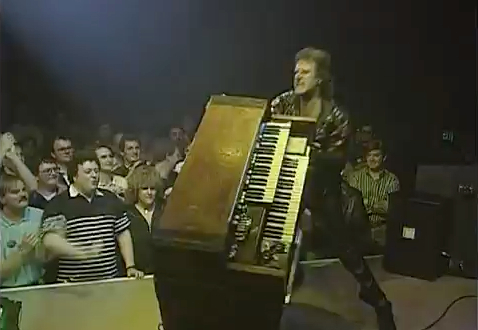 There it was – the organ, and by its side a “kind of washing machine“! We had no knowledge of how to successfully mic a Leslie yet the results are quite pleasing – recordings made on a Revox 736 (G36 in Europe, see specs) with 2x Reslo ribbon microphones (this was pretty much our standard gear for most recording sessions before our age of audio mixing capabilities). The recording is second copy and 47 years old stored in 2 cellars, so not pristine. By the way, the Revox 736 works perfectly (same cellars). Performance is by unknown keyboard player of the Cambridge Hammond Organ Center, recorded at the Angel Hotel. 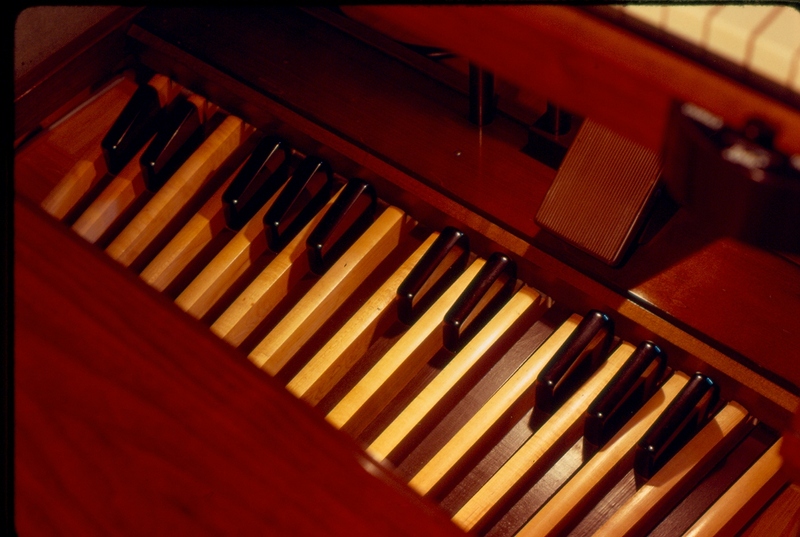 The Hammond here is probably a C-3 rather than a B-3, incorporating the same tone wheel sound generation. 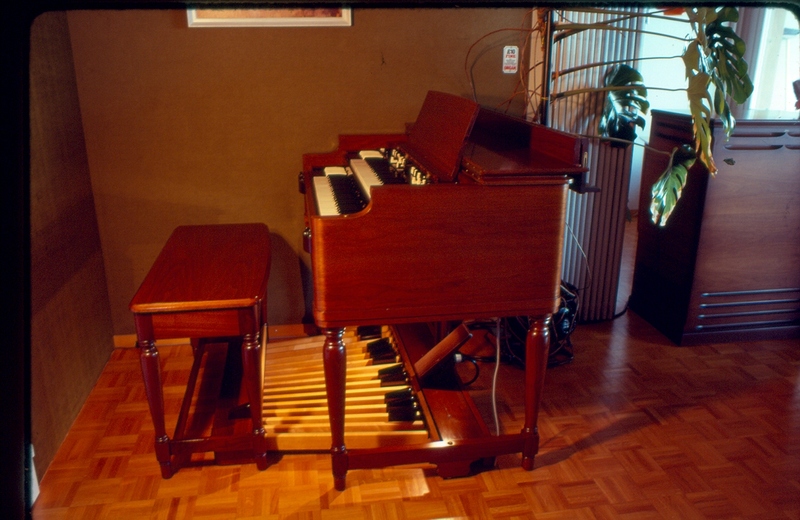 The Hammond C-3 is that used by Keith Emerson (Emerson, Lake & Palmer; ELP) as his main keyboard instrument for many years; completely metamorphosing the traditional organ playing style and sound produced. Keith also used an L-100 on stage which he literally threw around and generally abused, and which continued to work (L-100 is a previous version of the T-200 shown in our previous blog, without Leslie speaker). The ELP band was “born” at the Isle of Wight Festival in 1970. Their HD 2010 40th anniversary reunion is here (YouTube videos, no guarantee of them remaining on-line !) After 40 years the Hammond (Goff restored) remained the center piece, but augmented with other keyboards and a giant Moog synth! Jon Lord of Deep Purple used a model C-3, very much modified with ring modulator and heavy distortion – again pushing the “beast” to different kinds of limits which helped define the sound of the band. 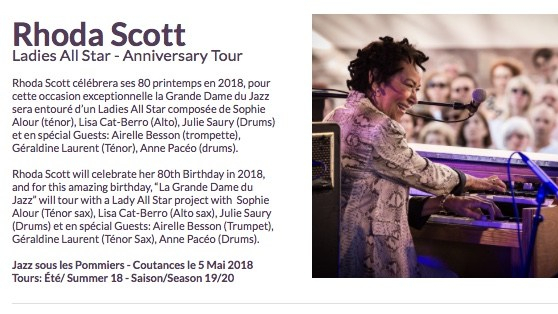 Back to the basic Hammond: in 1976, Rhoda Scott came to Geneva to play at the Victoria Hall – she performed several times here and on at least one occasion called on the services of the local Hammond dealer which supplied 95144. After attending the concert, and receiving her autograph on a vinyl record cover, a request for her to come home and play our B-3 was politely turned down (!) However, a few days later the concert was broadcast on regional Swiss radio. In those days our radio stations were not yet transmitting regularly in stereo – so, in wonderful ‘black & white’ mono, here are four segments of that concert. Although this next video is from a concert in Paris, Rhoda’s stage arrangement is similar to that at the Victoria Hall in Geneva – two Leslie speaker cabinets the B-3 and drummer. Also note the size of the cameras – in front and being pulled around the stage ! A whiter shade of pale by Procol Harum 2006, Danish National Concert Orchestra and choir at Ledreborg Castle, Denmark in August 2006 — Essential B-3 Hammond. This entry was posted in .pre-2009, Keyboard Musical Instruments and tagged B3. Bookmark the permalink.